(MENAFN Editorial) A revolutionary new weighing scale, invented by an NHS nurse and the first of its type in the world, will have huge benefits for patients, according to a member of the senior team at NHS Lanarkshire. The Patient Transfer Scale, which will be launched later this year, is designed to weigh immobile patients faster and more easily than current solutions. An accurate weight reading is important when drug dosages need to be calculated or treatment administered, particularly if the patients condition is serious. NICE guidelines (2006) state patients admitted to hospital should have a weight on admission and then a weekly weight. The Patient Transfer Scale was invented by Gillian Taylor, a former NHS Lanarkshire Emergency Department nurse. Gillian was frustrated at not being able to weigh immobile patients admitted to the Emergency Department where she worked. The only way to weigh an immobile patient was to use a hoist scale or a bed scale, but both were time consuming, and could be cumbersome too. I decided there must be an easier way to weigh these patients, said Gillian. Then later, working in practice development for Stroke services, it became clear getting an accurate weight quickly can help save a life. Gillian had the idea of weighing a patient as they are transferred from a trolley to a bed, an existing process that requires the use of a device known as a transfer board. I realised that if a patient is weighed as they are transferred to a bed, using a transfer board, they can be weighed quickly without time being taken to weigh them. This means as soon as the patient is admitted to hospital there is a weight reading that can be used to accurately administer medication as soon as possible. With help from NHS Lanarkshire, Scottish Health Innovations Limited (SHIL) and weighing scale manufacturer Marsden, Gillian was able to develop the product and bring it to market. It has been tested in 30 hospitals by Marsden with feedback provided by each hospital. This provided guidance for the final design. Richard Black, Managing Director of Marsden, said: We were delighted to be approached by Gillian in 2016 and asked to develop her invention. The Patient Transfer Scale is a revolutionary idea and it will help hospitals deliver better patient care by weighing them with dignity and prescribing drug dosages with confidence. This scale is the first of its type in the world - and we believe it can change the way hospitals operate around the world. Raymond Hamill, Senior Research & Development Manager at NHS Lanarkshire, said: We believe that the Patient Transfer Scale will have huge benefits for patient outcomes. This is the first time NHS Lanarkshire has worked through this process and we are grateful for the support we received from the Chief Scientist Office Scotland, Scottish Health Innovations Limited and Marsden. We are very proud of Gillian and of the part we played to help turn her idea into a tangible product. Hopefully this will inspire other NHS staff to identify opportunities and make them aware that support is available to make them a reality. Graham Watson, Executive Chairman at Scottish Health Innovations Limited (SHIL) said: The Patient Transfer Scale (PTS) is an exemplar of front line health professionals identifying new, more efficient ways to improve patient care. By accelerating the speed at which time critical medications can be administered it offers significant benefit in the treatment of stroke, sepsis, pain management and other conditions whereby a standing weight measurement cannot be achieved. Through close collaboration with Gillian, the inventor; NHS Lanarkshire and Marsden, a leading manufacturer of medical weighing scales, the PTS has been developed from an idea into a viable, commercial product ready for launch later this year. It is testament to the rich resource of ideas and innovations across NHS Scotland, and as the only organisation set up to work with NHS Scotland on commercialisation activity, SHIL are very proud to have supported this revolutionary new product. PTS inventor Gillian Taylor is available for interview. Please contact us for more information. The Patient Transfer Scales official launch will take place this November. Marsden is a weighing scales manufacturer founded in 1926, and has supplied the NHS with medical weighing equipment for 50 years. 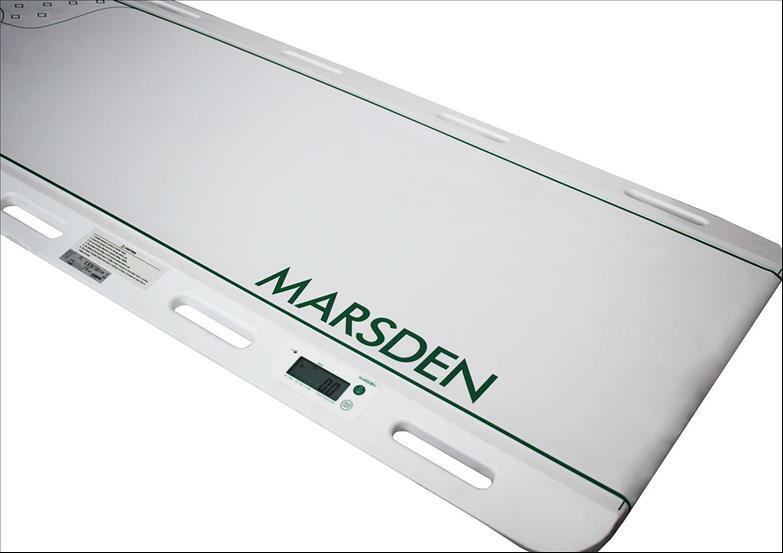 Marsden is the UKs leading supplier of medical scales to hospitals, GPs and care homes. There are over 100,000 Marsden scales helping deliver and improve patient care across the NHS and many more tens of thousands in hospitals throughout the EU and further afield. Marsden is headquartered in Rotherham, South Yorkshire. Scottish Health Innovations Ltd (SHIL) work in partnership with NHS Scotland to identify, protect, develop and commercialise healthcare innovations to improve patient care. The multidisciplinary team use specialised knowledge to help bring new ideas and innovations from healthcare professionals to life. This includes intellectual property advice and protection, project management, idea incubation, funding advice, development and commercialisation, and post-commercialisation monitoring.